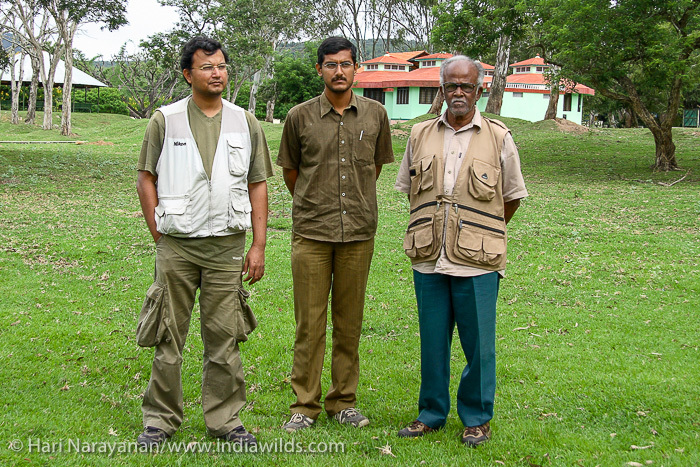 Laxminarayanan and his brother Hari had wanted to go to Bandipur, and were urging me to plan a trip. Mr. TNA Perumal, the doyen of wildlife photography of the yesteryears, agreed to join and soon four of us were on our way to Bandipur. We started early in the morning from Bangalore and reached Bandipur Forest Rest House by around 12 noon. After unpacking, we were ready to have our lunch. The macaques were trying to sneak inside the room and had to be careful with our food and photographic equipment. 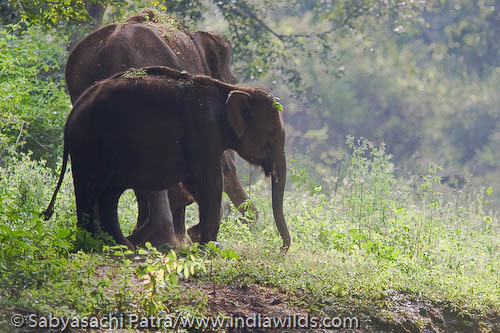 In the afternoon, we entered into the forest and soon sighted an elephant and calf on the road. The light was a bit harsh and the elephants were close. I was driving with my EOS 1D Mark II and Canon EF 400mm f2.8 L IS lens on my lap. The elephants were too close for my 400mm. There was an armada speeding towards us in the road, and the elephants immediately got into the bush. We turned left and after sometime came across three Sambars (Cervus unicolor). 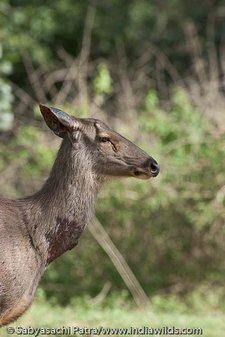 The Sambar had a pronounced sore patch. The sambar was on the left side and I had to handheld my 400mm f2.8 IS and photograph through the left window. It should be noted that we saw the sore patch on August. The flies were swarming around the sore patch. After watching the Sambar for a few minutes, we drove ahead. Soon we came across a lizard near the water. It kept on moving towards us and soon was close enough for me to just get its head filling the entire frame. After a few minutes, I found one Ford Endeavour moving towards us and I discovered Dr. Ajit Huilgol in that vehicle. And a couple of minutes later, the traffic jam was complete with a forest department canter reaching the place. 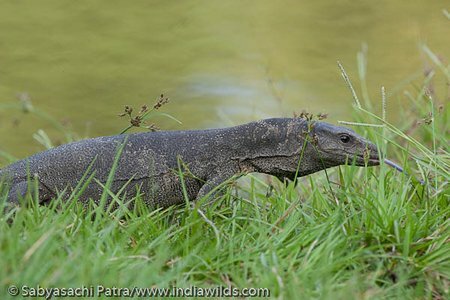 The monitor lizard had moved away and was appearing as a small object. We then moved ahead. Towards evening the lights started going down and we came across a herd of elephants. And I discovered that there were a few tourist vehicles about 30 yards behind the elephants. A few elephants from the herd were yet to cross over to the left side and were hidden in the dense lantana bushes. The elephants at the left started mud bathing. The matriarch gave the signal for the elephants to move. 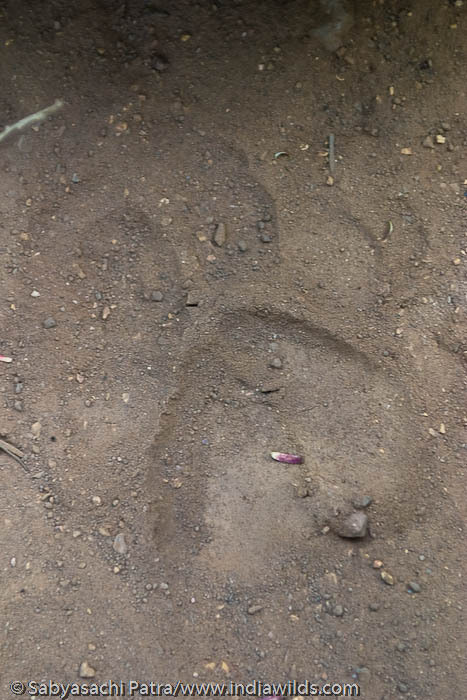 An approximately 3 year old juvenile elephant came close to my SUV and felt a bit intimidated. The matriarch moved ahead to calm it and they entered into the dense lantana bushes on our left. The sighting was not conducive for great photography. 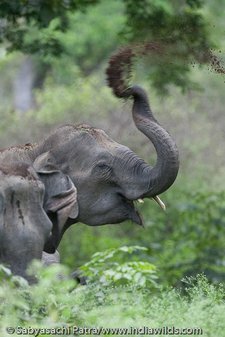 However, I was happy at observing the elephants and listening to their rumbling sounds. We then moved ahead and arrived at a T junction. When I turned to the left, we could find a few langurs on the ground eating lantana leaves. Lantana, being an exotic first imported by the British as flowering plants have gone wild and invaded our forests. The leaves have toxic impact on the herbivores. 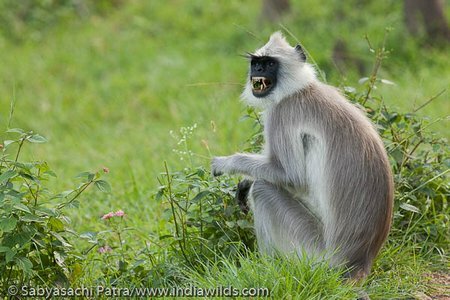 However, it seems that langurs have got accustomed to eating its flowers, buds and leaves. I am not sure whether anyone has done any study on the impact of lantana on the langur. Normally, I don’t stop for shooting langurs. However, the lighting was good. And Mr TNA Perumal, the pictorialist that he is, never missed an opportunity to photograph any subject in good lighting. 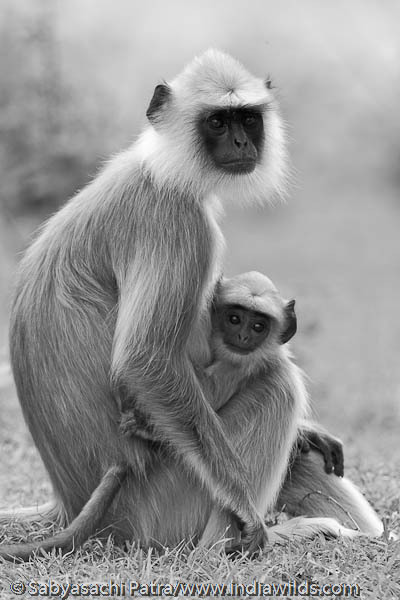 I accordingly stopped the Safari and photographed the langurs with my 400mm. I opened the door and placed the lens in the wedge between the vehicle and the door and got enough stability to get sharp images. 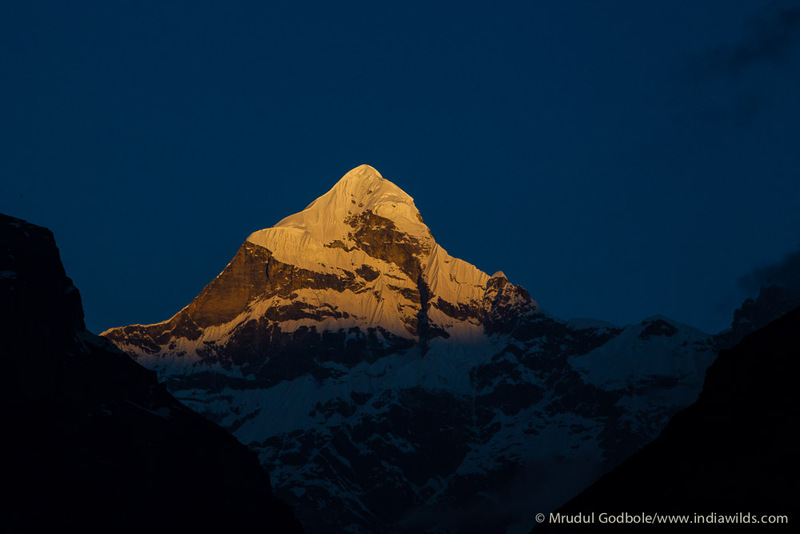 The sun was setting and light had gone down low enough to prompt us to return to the Forest Rest House. We soon started chatting over a cup of tea. The images were downloaded, and after an early dinner we were about to retire for the night when we heard alarm calls. Any visitors to Bandipur would be surprised at the congregation of spotted deers (Axis axis) near the forest rest house in the evenings. In the night, you can see the deers resting on the ground in the forest rest house compound. This is an attempt to avoid predators. 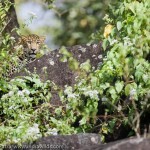 However, leopards come nearby to hunt. We moved out but couldn’t see the leopard. Later around midnight again we heard alarm calls. However, it seems the leopard was not successful. I was hopeful that we might sight a carnivore the next day and didn’t realise when I fell asleep. I was woken up by Laxminarayanan at around 4 am. We got ready and then met Mr. Jayakumar and group there and proceeded ahead. We were about to turn left when they moved ahead to turn left. So we drove ahead and took a right turn. Alas, who knew that we are going to miss the tiger? In the early morning dew, we photographed a jungle fowl and a mongoose. At a distance we could find a few tourist vehicles. I drove ahead and found an elephant digging a salt lick. The sound of digging was audible. 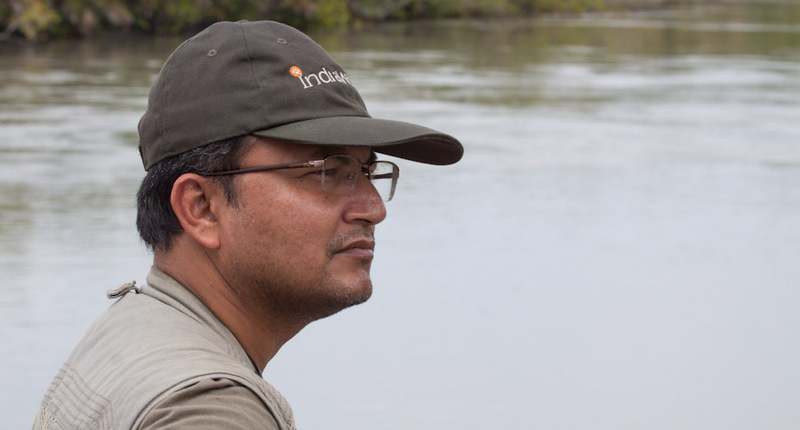 Since the elephant was on my right, I waited for Mr. TNA Perumal to click a few shots before I created some images. At f3.2 aperture, I could get the entire body covered by depth of field and was happy with the images. We then turned back and came to the main road. I decided to enter into an unused road. 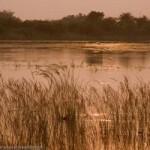 Mr. Perumal said that chances of sighting in such dense vegetation is remote. However, I decided to move ahead. We then reached an antipoaching camp and turned left and climbed a hill again. Suddenly a Changeable Hawk Eagle flew and sat on a branch on our left. The background was not cluttered as there were branches criss crossing behind its head. It sat patiently for about half an hour. So I could change converters and create various compositions. It was about 9 am and there were no more sightings on the way. After a quick breakfast, we decided to go to Gopalswamy Betta. 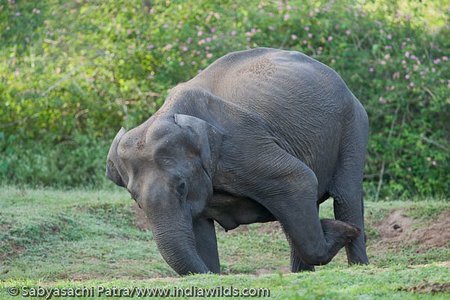 Though I was not keen on taking my heavy 400mm f2.8 IS lens, Mr. Perumal said that there are chances of sighting elephants on the slopes and asked me to carry the lens. It was however, packed in my bag. We were about to reach the Bandipur forest gate and saw a spotted deer (Axis axis) near the road side chewing on a kurkure packet. Herbivores, due to the salt content, like to lick and chew the empty wafers packets dropped by visitors. In the process, the stand on or near the road side and get hit by speeding vehicles. At times, they swallow these packets and die as well. 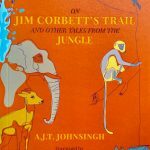 On one earlier occasion, I had seen an elephant dung containing a polythene laced with blood. When I was struggling to remove my camera and lens from the bag kept in the backseat, the deer moved into the lantana vegetation. Several cars came speeding and narrowly missed hitting us. Fortunately, I could document the deer chewing the plastic wafer packet using 800mm focal length. We then proceeded towards Gopalswamy Betta. Somehow, we missed the entry road and took a detour on a broken road. It was certainly not an issue as I had 4WD in my vehicle. On reaching the entry gate to Gopalswamy Betta, I was pleasantly surprised when the guard checked for plastics and took away polythene bags from the tourist vehicles. I wish this practice can be adopted in other places, including Bandipur. On reaching the summit of the hill, we got down to macro shooting. I hadn’t bro ught a macro lens, but Mr. Perumal started shooting. I discovered that it is a good place for macro work. 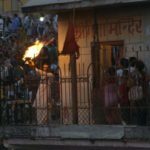 After a quick trip to the temple, we proceeded back to Bandipur. We sighted and counted a herd of seven elephants at a distance feeding on the leaves and branches on the hill slope. After observing them for about fifteen minutes, we moved ahead as the afternoon safari time was fast approaching. On reaching the forest rest house, I found a big wild boar close by. On a whim, I took out my new Nokia N97 phone and tip toed towards it to create a full frame image. Well, the phones have a long way to go before serious photographers like me can use it. 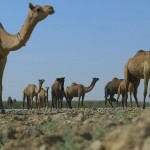 We reached a waterhole where the previous day a tigress was sighted. Unfortunately, we only found a gaur. I tried a few shots handholding my Canon 1D Mark II and Canon EF 400mm f2.8 L IS USM lens plus 2xII Tc combination. The weight is killing, but I got a few sharp images. 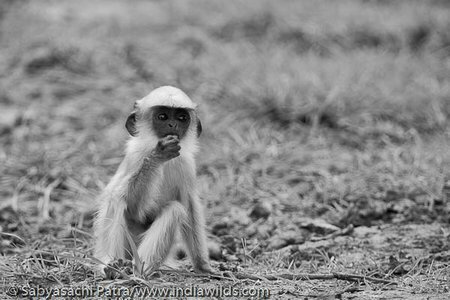 Later in the evening, we found a kid langur playing and then found gaurs in low light. An adult male gaur was getting ready to mount on a receptive female. It needed some more time, and we didn’t have much time in our hands as the forest gates closing time was fast approaching. We had to call it a day. Next day early in the morning apart from cheetals we didn’t have much sightings. We then waited at a place as Hari and Mr Perumal wanted to photograph the deers and langurs. I was watching a langur at a distance debarking a tree. 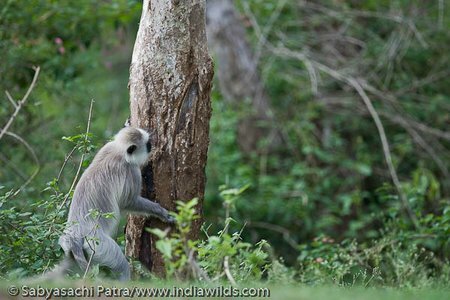 After some time it moved ahead and started mating with a female langur. Fortunately, I was ready and despite handholding my heavy lens, the images were sharp. Soon it was time for us to move ahead and bid adieu to Bandipur. 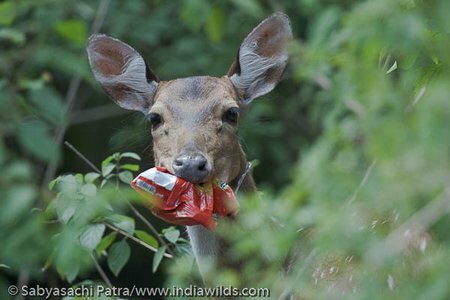 Spotted Deer with the junk packet is an excellent picture. Can be used to teach tourists. Excellent photographs but the one that moved me most was the chital chewing on the plastic bag. I have noticed that policing is least strict in Bandipur. 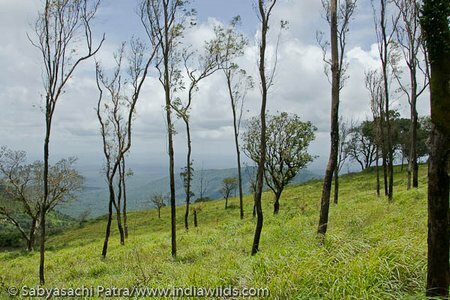 Driving along the Mysore-Ooty road through Bandipur and Mudumalai I have noticed plastic strewn right through the park. It’s sad and somewhat hopeless. Roma your pictures bruhogt back a lot of memories !. 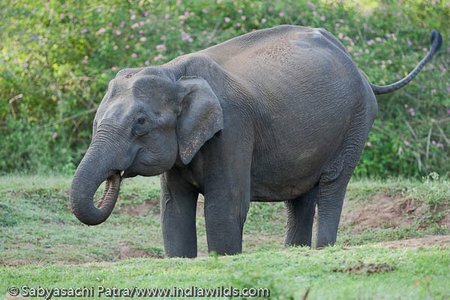 We took a road trip to kabini, bandipur and wayanad. Beautiful is an understatement. That was the best trip ever, especially kabini, the tuskers almost blocked the jeep and it was an exciting moment. Karnataka is such a beautiful state and most are not aware of its rustic beauty and yes the food in most jungle lodges is awesome !Thats true, Dee. Karnataka’s beauty is not well known. I myself was zapped at the awesome natural habitat in which the animals were living. It was so unexpected. You should plan a vacation in the wilds sometime. That was a well written observation for wildlife watchers.